It's powered by a Euro 4 compliant liquid cooled 1,200cc parallel twin engine, producing 79bhp at 6,550rpm and maximum torque at just 3,100rpm. 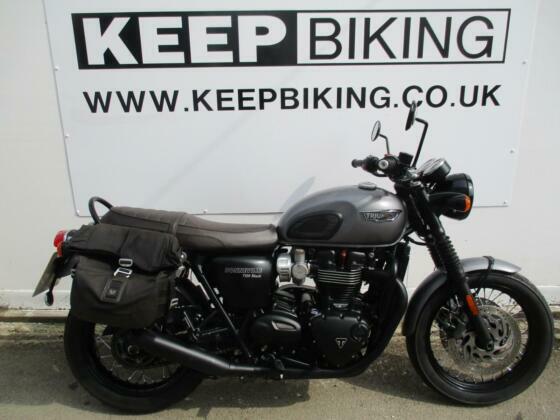 Triumph have resurrected the T120 name from the 1959-1974 model but they really only have their looks in common, with the original having almost half the capacity. The clocks look old school but nestled in them are two LCD displays which show the fuel gauge, range until empty, gear position, traction control status and heated grip level (check the pics above). The special T120 Black edition is basically the same bike but with the exhaust, engine, wheel rims and pillion grab rail blacked out. You also get a dark brown seat instead of the standard black seat. The wheels are wire spoke with the 18" front taking a 100/90 tyre and the rear 17" a 150/70. 2019: Ace Cafe edition is a limited run of 1,400 based on the Black edition with special graphics and numbered certificate. Diamond edition is a limited run of 900 and features a special white/silver scheme, unique union flag graphics and numbered certificate. Check the pics above.